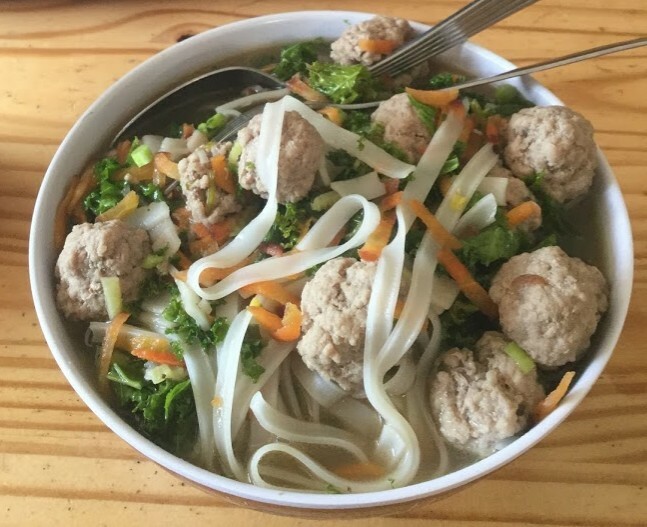 Disclaimer: This is not a traditional Phở, just this farmers very loose interpretation! Simmer Spray Creek pork bones (roast first for extra flavour), with some ginger, celery, onion, and carrots, for 8-24 hours and strain (you can make big batches ahead of time and freeze in ziplock bags for future use). 1. Soak the noodles in hot water water according to package instructions. 2. Grate or slice carrots, kale, radishes, celery, or any other veggies you can find in the garden or at the farmers market, and shape the ground pork into small balls (add salt if you’d like). 3. Bring the pork stock to a light boil, and add the veggies and pork balls. Continue to simmer a few minutes until the pork is cooked. Now add the pre-soaked noodles and serve! Everyone in the family can customize their own bowls with their favourite Asian sauces and garnishes. Enjoy!